Sister District is unique because it joins together specific excellent state legislative candidates with specific teams of volunteers, i.e. Sister District chapters. Sister District CA Peninsula members listen to Claudette Williams speaking to us via Skype, during our July meeting. Our fundraisers, phone banks, text banks, postcard parties, and meetings not only offer an opportunity to make positive change in our government, but also provide our members access to a great new group of friends! Learn about our events by checking out our Calendar for specific dates, information and links for our meetings, voter outreach and fund raising events. To see what we've been up to recently, see our most recent newsletter. 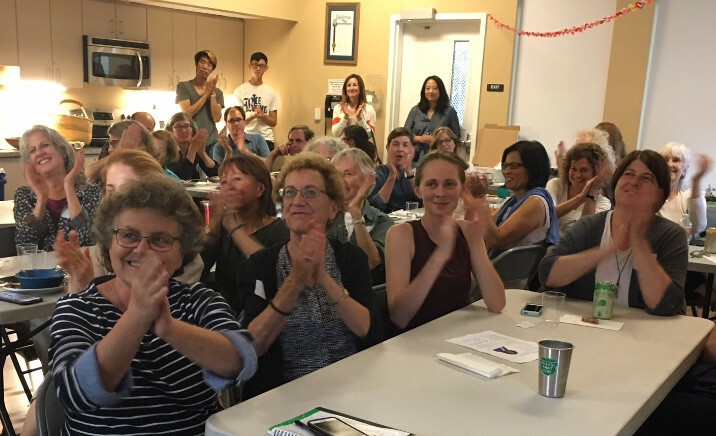 The best way to learn about us is to come to one of our monthly meetings, which are held every second Thursday of the month at 7:00-8:30pm at the Highlands Recreation Center, 1851 Lexington Ave, San Mateo. You can also find more information about our chapter and the many ways you can participate here on our website, and on our Facebook page, via Twitter, and Instagram. Sign up with Sister District, then attend an event, host one yourself, give what you can, research our campaigns, and connect with our community of volunteers!